This is it! 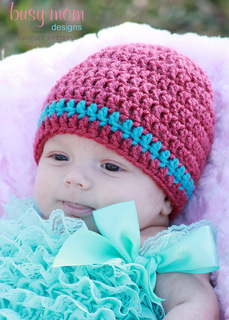 The Basic Beanie crochet pattern is perfect for making hats in any size! This pattern is great for beginners and can be completed in a short amount of time. Make perfect gifts for preemies, newborns, kids, teens or adults! This pattern is great for making charity hats. Use your favorite worsted weight yarn in any color, or a variety of colors! It is warm enough for cool weather, without ever getting too hot. For colder climates, use a warmer yarn (wool or acrylic), for a warmer climate use a cooler yarn (lightweight worsted, cotton or bamboo). Easy to embellish with a button, flower, clip, etc. 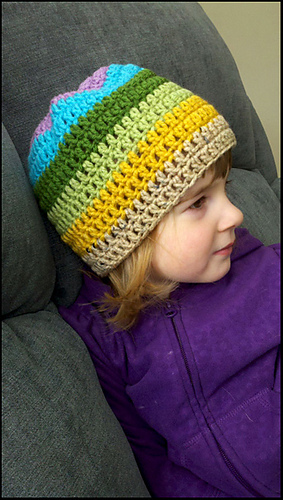 This pattern has been used and loved by hundreds of crocheters. I hope you love it too! 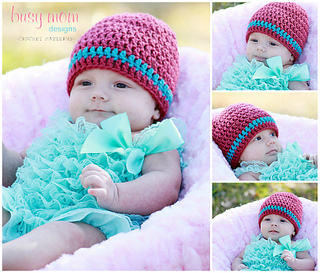 Pattern includes 7 sizes from preemie (or doll) to adults. Busy Mom Designs patterns are easy to follow and are explained in simple terms so even those new to crochet should be able to read and understand them with ease. Patterns may not be copied or shared, but all items made from these patterns may be sold by the purchaser - even online!